Our previous posts have covered the machine learning algorithms that would be most commonly used and that would more accessible for non technical people. What other advanced machine learning algorithms should a business person know about? There are others that are more advanced and really would be used by data scientists. But since your machine learning journey might end up with collaboration with a data scientist at some point, it helps to know the other tools that are available to them. Two areas, deep learning and dimensionality reduction, are of interest. Deep learning, also call modern neural networks, uses a large number of computing nodes to simulate a biological neural network. Because of it is technical in nature, normally data scientists are needed to implement these ML algorithms. It is interesting to know that, many times these are just a different approach for classification and regression types of models already discussed in earlier posts. This is especially true when the data is not regular, structured business data. For example, photo recognition and image classification are commonly done with deep learning. Dimensionality reduction can also be of interest to you. These types of algorithms are used to simplify data so that the result can be more easily applied in other machine learning algorithms. 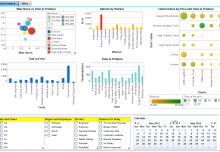 Another application is to simplify data for human consumption such as for visualization. Consumers can use BI software, too – Black Friday Shopping Tool is ready.